Actually, paint in general kind of makes me all giddy inside. I don’t know what it is but I love to paint. I think you see my point, right? Or is that you should see my PAINT??? Oh and something really new and fabulous??? I sort of ran out of LARGE surfaces but I still wanted to paint – so I am taking lessons in acrylic. Which sort of led to re-painting my old desk that HOLDS my paint supplies. Oh, did I mention how I like to paint my toes too? Yes, it’s fun to do that kind of painting too! Painting is fun. So was reading your post! I’m glad you joined in! Do you have any pictures of your barn? Thanks for stopping in… I was kind of excited about the word prompt because there’s always something going on here about paint it really made me laugh to see that it was our word for the week. Even my husband thought it was hilarious. Painting is a lot of fun! I can remember as a kid that was my favorite art project to do. We would just throw paint onto a piece of paper and call it “art” we’d be all it’s a fire house because it’s red…and it was just a bunch of red lines HAHA. And by the way… I’ve seen some art that looks like a bunch of red lines… that becomes famous! I’m 48 and never thought I could do any of this… you just never know! What a fun take on the word! Thanks for popping by my post earlier! I’m Heather, dropping in from Five Minute Friday, nice to meet you! I’m learning watercolors right now too! And the painting in your picture is beautiful! 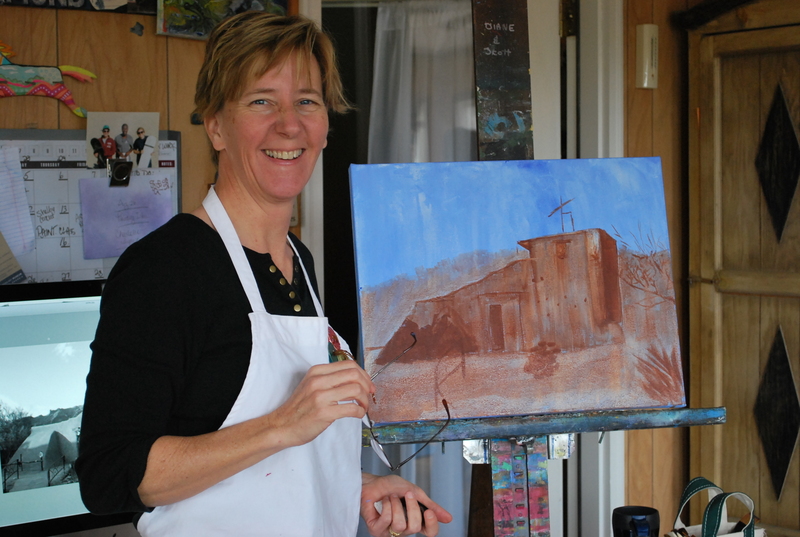 You’re so adorable, all giddy about painting… this prompt was definitely right up your alley (or canvas, or wall, or porch post… ;-D )! I enjoyed seeing and hearing of all the surfaces you paint on. You’ve got a gift, that’s for sure!